The new lifestyles resulting from globalization and the electronic technologies generated new highly technical spaces which are not limited to only few people: it is a possibility accessible to everybody. The architect faces new ways of living in homes, where fun and learning are combined. We are in a world that requires adaptation to residential spaces that are leaning more and more into automation and self-intelligence. Walters-Storyk Design Group (WSDG), a company specialized in highly complex technologic development and author of many prestigious projects around the globe, was chosen to the accomplishment of Casa Ezeiza. Founded in 1968 by John Story as John Storyk Design Inc., it was the firm that built the legendary Jimi Hendrix’s recording studio (still operating), Electric Lady Studios, in Greenwich Village, New York. In 1988 it changes its name to the current, and from there it has been applying its resources and experience in architectural acoustics and audiovisual technology integration in projects as Jazz at Lincoln Center, the KKL Concert Hall in Luzern, Switzerland and Berklee College of Music. The quality of the WSDG designs was applied in Casa Ezeiza, a residence located in the golf area of a country club in Ezeiza, just outside the city of Buenos Aires, Argentina, only minutes away from the international airport. The architects of this project were Silvia Campos Ulloa, WSDG Partner, Latin Principal, in charge of the architecture and interior design, and Sergio Molho, WSDG Partner, Project Engineer, the brain behind the audiovisual systems integration and automation. The years of experience was one of the most important factors for achieving the quality they were looking for, as Silvia explains: “In fact, the task of combining technology with details of beauty and comfort its my daily job; is the one I have been doing for twenty years in recording studios, conference rooms, post-production and broadcasting rooms. In Casa Ezeiza, the challenge was to go from a technical space, to a family home, where all those factors needed to be combined. For this project I had to change my perspective, since it was the total opposite”. In fact, the owners wanted a highly technologic familiar space, which will help the development and enjoyment of the main hobbies of most of the family members: music and film. This is why it was arranged to have a special emphasis in the functionality, economy, comfort, and beauty that encourages these activities. As a consequence, the interior design received the utmost care, because both the image and sound need specific spaces to be appreciated the way it should be. In the initial stage, many constructional possibilities appeared. The firsts designs were proposals for a building of 2 or 3 stories, where the spaces were bigger than the resultants in the final construction; also there was in the plans to use traditional methods and construction materials, such as concrete and brick. However, the economic factors of the location, influenced in a determinant way in the change of the construction and design, because in Argentina, the costs of the materials and labor happen to be higher than the value of the finished property, which generates an important conflict in terms of construction investments, since it has not have an immediate return both in economic and esthetic terms. These conditions are, in part, the reason why many constructions make emphasis in the comfort focused in the interior design. Aiming to a more efficient administration of the monetary resources, the structural construction criteria changed and became more flexible. In WSDG we look for less traditional methods, and we leave aside the strict and classic standards of construction, with great acceptance in the market. This route change was the key that influenced the conception of this project, giving it more flexible characteristics, since it reduced it physical size and it notably increased its technological possibilities. The emphasis was set to the interior design, which should stand out beyond the conventional. A mixed design, untraditional indeed, was the final decision. As a result of this process, the residence adopted features of a recording studio, whose rectangular ground became the mainstay of the interior acoustic, feature that it is unusual to stand out in most homes. The different interior spaces are unified, however they conserve their privacy. 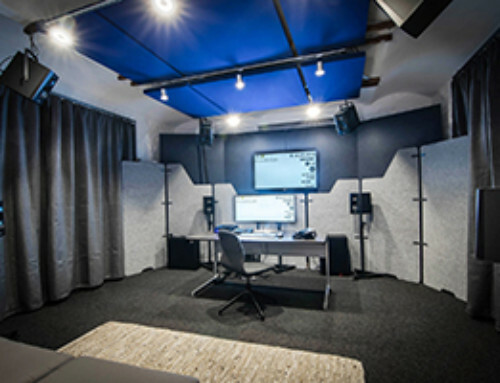 According to the owners’ activities, the acoustic factor was extremely important, this is why the sound needed to be diffused in the most efficient way, the ambience must be warm and the environmental comfort (HVAC) of each area very accurate. 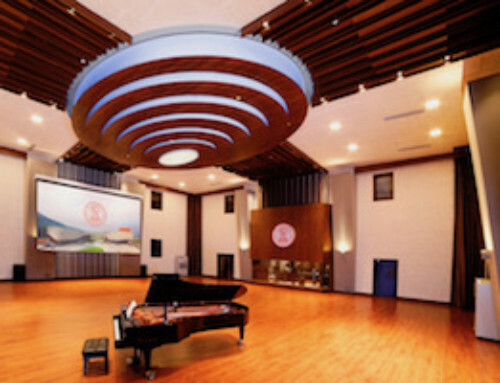 In order to achieve it, the main spaces were coated with hanging clouds (acoustic absorption panels), such as it is done at professional recording studios, that also carry the lighting. Also diffusers were installed in the front section of the house. The result was a minimalist and transparent cube, 13 feet tall in all areas, that acts as a place of fun and rest with cutting edge technology for a family residence. “Professionally, we all enjoyed the day-by-day of the project, as well as we were amazed by the outcome reached. From the human aspect, we appreciate how important and profitable is the open-minded approach of the people, who desire and invest to create innovative spaces and overcome the boundaries. Of the ones with their sight set in changing. This is a good approach in life… because there is always more!”, Silvia points out. Located in the middle of a big field with sights to an extensive golf court, the property is presented as a rectangular shape without external structural ambition, which does not implies a lack of design, but economics and planning. Because of its central location, the house brings conditions of viewing and enjoying the wonderful landscape from its 4 sides. From each space of the residence is possible to appreciate the delightful panorama and receive natural daylight. Thereby large windows were built in the main spaces, rooms and ceilings as well as acoustic glass doors for all the exterior carpentry; achieving ventilation and spreading light to the totality of the house. The minimalism on the general shapes and the complex technic treatment led us to play with a modern and simple style, both for the interior and the furnishing, based on glass, dark wood (for floors and furniture), white paint on the walls and ceiling, as well as silk and fur for the main carpets. A palette of greys was used for the genres intended to sofas, walls and acoustics panels of the main area. Modern art applications were chosen in order to accentuate some spaces, and the furnishing was custom made and exclusively designed. “To a family home that had to be modern, comfortable and with high expectations of design, it was added a limitless technological factor, but not only because of the gear and automation, but also by having similar acoustics conditions to a recording studio, from its structure to the final visual elements than later turned into the most important component of this project”, Silvia explained, who shows us with brief comments what she has acquired throughout her professional career. The construction of the house, including the finishing, decoration and details took 8 months. The speed of this execution was possible by using drywall construction systems that streamlined the process. The constructive system implemented was the same that it is used in recording and broadcasting studios, where the interior is isolated and decoupled with various layers of materials. Multiple layers of fibercement, plywood and cellulose insulation compose the exterior of the house, as the interior walls are made of 3 layers of gypsum of 15mm of width. Sergio Molho guided us into one of the essential steps of an automation design: “The audio and video systems integration and automation design was made at the same time that the project was created. The team who did the electrical conduits was also in charge of the whole pipes infrastructure, which is used for the distribution of the low voltage signals, such as: audio, video, net, control, etc. A prewiring was made prior to the execution of the interior finishes, and after entering the furniture, the finishes of the cables and the gear assembly took place”. Due to irregularities on the ground, it was necessary to construct a 1-meter platform above original level, from where the walls and roof perimeter was mounted. The construction plan required, for all the carpentry, to have double glazed windows to ensure the perfect acoustic and thermal isolation, technique that corresponds to the new tendencies of sustainable architecture, based on the saving of building materials, execution time and energy for the correct temperature control of the residence. According to this last point, another fundamental aspect of a smart design is the positioning and shape of the windows, located that way in order to take advantage of the daylight and save artificial lighting energy. Three wide bedrooms with window walls that provide a large quantity of natural light and pleasing views of the outdoor landscape were design. In each one of those spaces, acoustic treatments were performed on the ceilings that contain the direct and indirect lighting. Besides each one of them count with high quality multi use speakers, which can be individually activated or unified to the house sound integral system. A familiar Jacuzzi was constructed in the exterior area of the main bedroom, collocated in platform level at the backyard with a wonderful viewing of the golf. This space is also equipped with high quality exterior speakers, as all the other exterior areas are, giving a wide range of possibilities when deciding to have the same music all over the house, or controlling them individually by any smartphone, iPad or remote controller. • Movie: a 5.1 system in the home theater, with the possibility of assigning stereo feeds to the other zones individually. 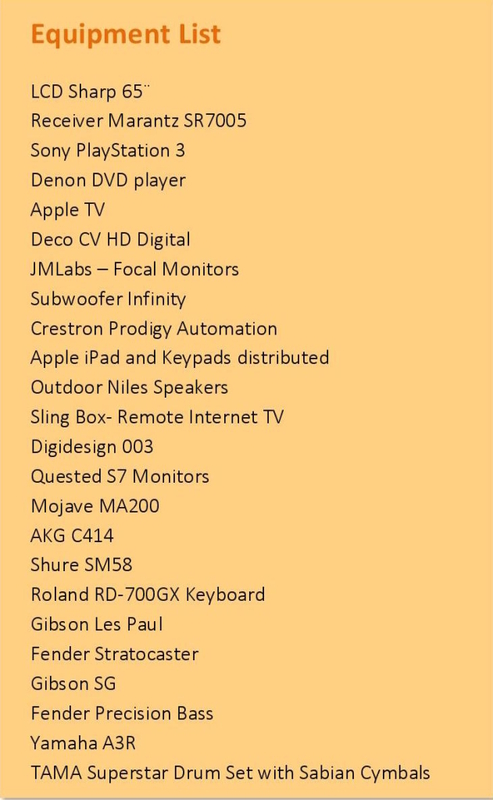 • Independent Zones: allowing each zone to choose an independent source of music (CD, DVD, iPod, Apple TV, Phone, etc.) at its own level. • Show Mode: rehearsing and recording, use as a source the stereo out of the recording console and reproduce it in the selected zone. Both of these spaces are unified and only separated by half a wall that from the kitchen is part of the support of the furniture and from the dining room is a bar. You can access to both of these spaces from the exterior individually. The dining room presents an indoor gas professional grill and a typical Argentinian grill for charcoal or wood use, which is the preferred by the proprietary for his family delight, social lunches and dinners. The existence of this grill in such a delicate space reflects an extensive and well-studied ventilation system, that does not allows the access of smell nor smoke inside of the house; because of this the grill can be used at anytime of the day, with any weather all around the year being this a tremendous advantage. When it is not in use, a door made of stainless steel that integrates and matches perfectly to the modern space covers it. The specifically designed and comfortable 12-person white-lacquered table with stainless steel legs is beautifully complemented by black Panton chairs (Vitra/Verner Panton 1967). In this sector we can also find an exclusive crockery cabinet with a white structure, natural wood doors and a natural onyx top, where a soft and warm light gets filtered. The kitchen is lined by custom made white-wooden furniture, with interesting sectors of glazed doors for glassware, and respecting spaces for machinery of cold and hot water, wines fridge and wireless vacuums. A dark wood furniture is placed in the center, having on one side an electronic stove top with oven, and on the other side an additional bar, converting it in a space to eat and share. The isle is crowned by a hanging circular ceiling, which contains a kitchen extractor and air purifier, the direct lighting and 2 invisible speakers feeding sound to this sector. The lighting design is based on the use of halogen and dichroic light devices, and also the design of the indirect warm lights, which highlight the interior architecture details. These two or three types of devices that emit a different light temperature were applied in all the spaces, giving the user a way of choose the light style depending on the occasion or feeling. The lighting has a very personal and state-of-the-art design, which generates that in the morning, the house looks brightly and natural with the light embracing all the spaces, and in the night it takes a different spirit, highlighting all the details that makes Casa Ezeiza so unique. This house was designed to have an automated control of the lighting and audio and video system in the living room area. It is also this system what allows us to control the distribution of the music along the entire place. The home theater as the rest the home have as sources a PlayStation 3 (that also is used as a Blu-Ray disc player), a DVD player, an Apple TV (for Netflix and other uses) and any mobile device (iPhone). As the whole system is unified to the recording studio, the house can go into the “Party” mode, where all the zones reproduce the same music from any of the sources previously mentioned, or even go into the “Show” mode. The audio and video scenes are attached with the preprogrammed lighting scenes to generate the right atmosphere for each situation. • Lutron Graphic Eye on the wall for wired control of the lighting system. This residence is designed to satisfy the modern man needs, who wants to feel as in a 5-star hotel in its own space, not only for the luxury or comfort, but also for the technological devices he can reach. The modern residence allows the easy interaction with the latest of communication, information and entertainment, establishing with these characteristics new parameters for the everyday life.